Early season ski holidays in very snow-sure ski resorts can allow you to be cruising the slopes as early as late November. However, most high altitude resorts will not open until early December when the ski season in the Alps is widely expected to start each year. What is of paramount importance is to choose your resort wisely - get that wrong and you could end up on a walking holiday rather than a skiing one. Choose the right resort, however, and you could be boasting to your friends that you skied in knee deep powder well before Christmas. Choose a high altitude, snow-sure resort. Preferably one that includes a glacier. Choose a region of the Alps that has a reliable track record for good early snow falls. Choose a resort with good coverage of snow-making machines. Hold off booking your holiday until you know that the snow has arrived. The main advantage is one of price. Most of the tour operators we sell are virtually giving holidays away in the run-up to Christmas week when few people have time to ski. Every year we see holidays staying in really smart catered chalets going for a bargain. Other advantages are: the slopes are quiet; there are no lift queues; staff are motivated and keen to impress; lift passes are often cheaper and ski schools offer lower rates. 1) Tignes has to be one of the most snow-sure resorts we know in late November and early December. With skiing on the Grande Motte glacier (3,455m altitude) and runs taking you down to Val Claret at 2,200m there is plenty of good early season skiing to enjoy. 2) Val d'Isere (which shares the same ski area with Tignes) is another favourite. With high altitude skiing as well as an extensive snow-making system this resort is a good bet. With so many chalets and chalet hotels there are always great early season ski holiday offers. 3) Val Thorens in the Three Valleys area with a resort height of 2,300m is the highest ski resort in Europe. With extensive slopes for all abilities this resort is always a safe bet early in the season. 4) Zermatt is a must if you want to see some of the most spectacular scenery in the Alps. A large traditional resort with an extensive ski area and the best mountain restaurants in the world would suit couples best. 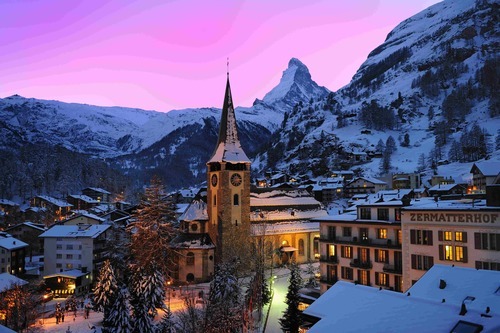 5) Cervinia (sharing the same ski area with Zermatt) is Italy’s highest ski resort. There is plenty of good intermediate terrain and good value hotel accommodation in this popular resort. 6) Obergurgl and Hochgurgl are two linked high altitude Austrian resorts with an amazing 99% of their pisted area covered by snow-making machines. 7) Ischgl is the place to party with the best headline bands officially opening the ski season at the early December rock festival. The skiing area is large and the apres ski scene even larger - so if you like your ski holidays with a Germanic feel then this is the resort to choose. 8) Breckenridge in Colorado, USA, is always a great resort to choose for early season skiing. Experience skiing in the States for the first time and discover queue free skiing and a resort which retains some of its 'wild west' heritage. With a good snow record in December, cheaper accommodation prices and some excellent ski terrain it’s a 'no-brainer'.